Why make almond milk at home in the first place? And, just how is almond milk made at home? Many families are now avoiding dairy products. Some are avoiding it due to allergies, growing concern over antibiotic use in cows, and the idea of cow milk not being healthy for you. There ARE some who experience bloating and gas due to dairy, so avoiding it is best for them. While I don’t agree with cow milk being UNhealthy, it’s nice to have alternatives to dairy and dairy products. As a generality, we use almond milk in place of diary for cereal, some baking and just enjoying by the glassful. However, pricing almond milk these days brings us a scary detail. It is over $7 a gallon in my area! That is NOT the most budget friendly item on my grocery list. Almond milk from the store also doesn’t last long in the fridge. Even when I only buy a 1/2 gallon at a time, it doesn’t always get used up before it starts to smell “off” and I need to give it to the chickens. Sure, they like almond milk, but I don’t want to be just tossing it out them each week. Learning to make my own at home has saved me time and money. PLUS, you can store the almonds in your pantry and make it as you need it, a little or a lot. This keeps it from spoiling and being wasteful, as well has having fresh almond milk every single time. Making it at home also means you control the ingredients, adding sweeteners as you like, and in the amounts you like. No more running out of almond milk as you are making a recipe. Just whip up another batch and you are good to go! I like to make this unsweetened and in smaller, easy to use up batches. If I am pouring a glass to drink, I’ll add a bit of stevia just before serving. Keeping it unsweetened makes it more versatile to me. I can use it in sweet or savory applications then with no worries. These sweeteners are all natural, low glycemic and taste so yummy! To make your almond milk, you will want to first soak your overnight. This helps to reduce phytic acid and make the nuts more easily digested. 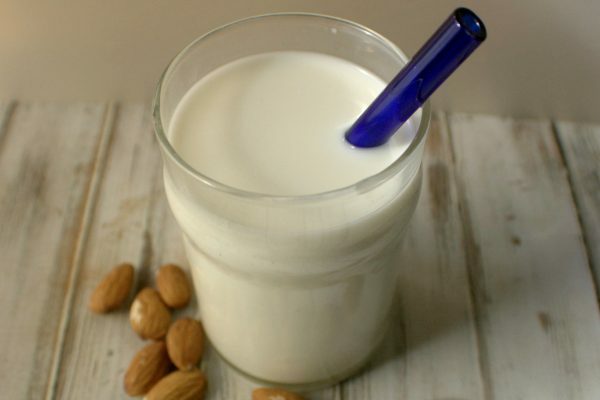 If you are making milk with the soaked almonds, you do not need to dry them. Just use as they are. If you are storing the soaked almonds for later, you will want to dry them in the dehydrator or in the oven at 200 for 3-4 hours until crunchy. This will help keep them from spoiling. To make your milk, add almonds and water in your chosen ratios to a high speed blender. You can also use a food processor, but the time needed to process will be a bit longer. 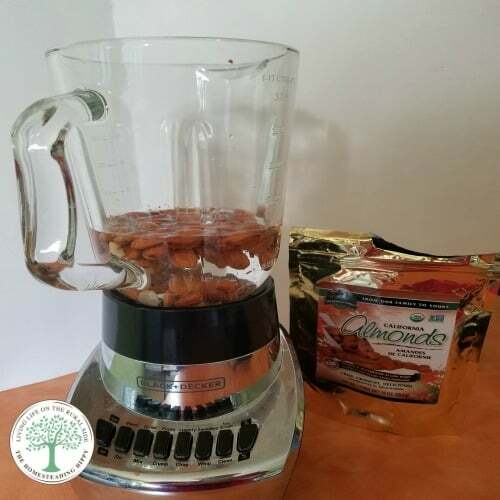 Blend the nuts and water on high for 2-3 minutes in your blender. You will start to see the water turn “milky” and the nuts will be processed up. 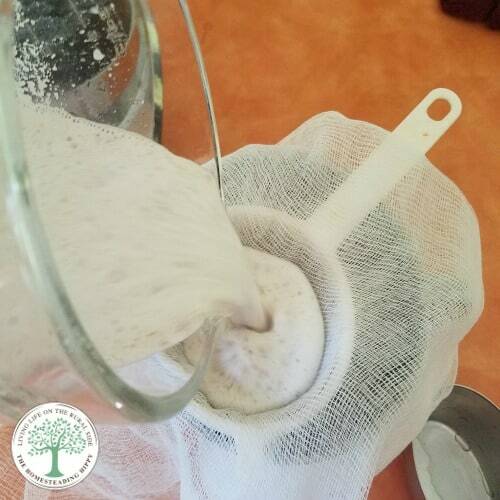 Strain the milk into a glass using either a nut milk bag or a cheesecloth. You can also use a cotton bandana in a pinch. The leftover nut meal can be spread out on a cookie sheet and placed in a 200 oven for 5-10 minutes and you can use that as almond meal! Store your homemade almond milk in the fridge for 2-3 days, tightly covered. Enjoy! 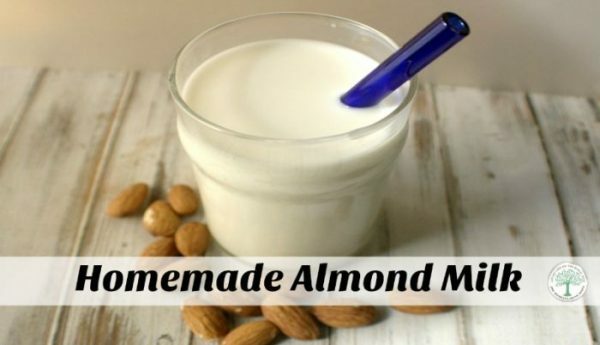 Do you make your own homemade almond milk? How do you sweeten yours, if at all? Be sure to pin this for later! 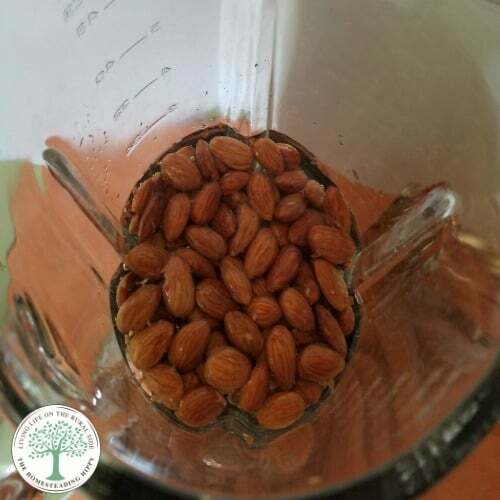 Add the almonds to a blender. Cover almonds with the water. Blend on high for 2 minutes, until smooth. The appearance will begin to look very milk-like. Strain the almond milk through a cheesecloth. Gently squeeze to get all the almond milk out. Sweeten to taste, and enjoy! Store in the fridge for 2-3 days. 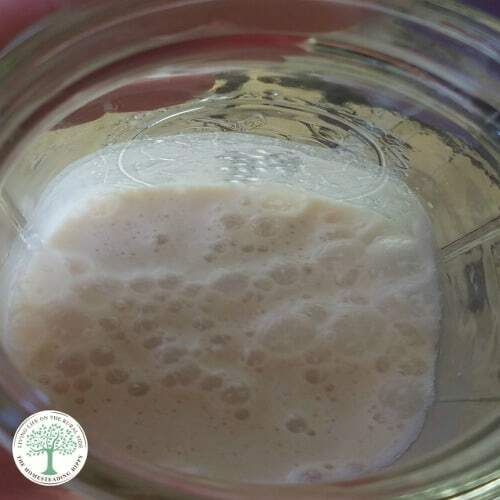 to make vanilla almond milk, add 1/2 teaspoon of vanilla extract after straining. Are the almonds raw? I see that they can be toasted after being used but wasn’t sure if I am buying them if they can be roasted almonds or needs to be raw. I actually use raw, soaked and dehydrated nuts. Nice write up – I may just have to try this! Thanks! That’s a great idea for a sweetener! Thanks for sharing!